Follow our social media streams Oct. 24 to 31 for our informal celebration of Bat Week. 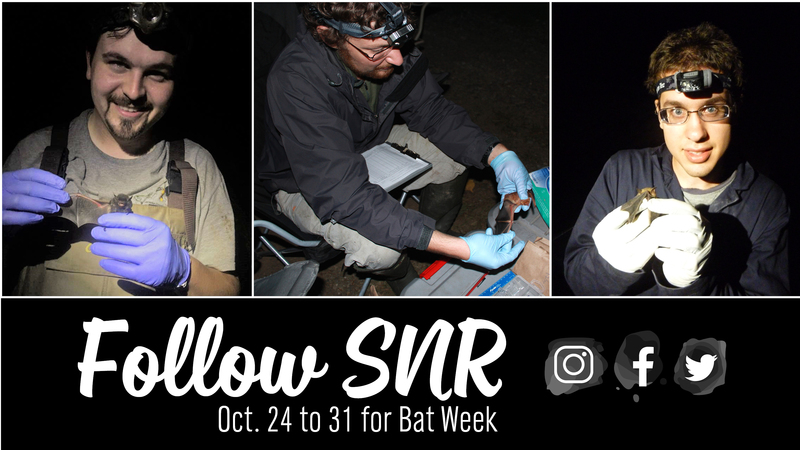 Posts will include features on our three graduate student bat researchers, Michael Whitby, Baxter Seguin and Christopher Fill with the Nebraska Cooperative Fish and Wildlife Research Unit, as well as ways you can be a bat hero. Bat Week is an annual, international celebration of the role of bats in nature. It is organized by a team of representatives from across the United States and Canada from conservation organizations and government departments. At the School of Natural Resources, undergraduate and graduate students play an important role in researching and conserving our state’s bats. Learn more about their work this week on Facebook, Instagram or Twitter.